This post is going to a be a bit different to my previously miserable attempts at writing. Rather than brain dumping my irrational and sometimes melodramatic thoughts down about a recent event or gripe with the way the clouds look at me, this one is going to be about a thought process and insight into how I come up with my recipes and ideas for new food. I don’t do lot of things often: family get-togethers, walks in the park, sleep, shave or go shopping. The latter means that I have to force myself to be creative with what I have in the house and to be honest, it works pretty well. I always have a solid base of standard things kicking around: bread ferment, some kind of pickle or fermented vegetables, drippings or a new fruit I am trying out. 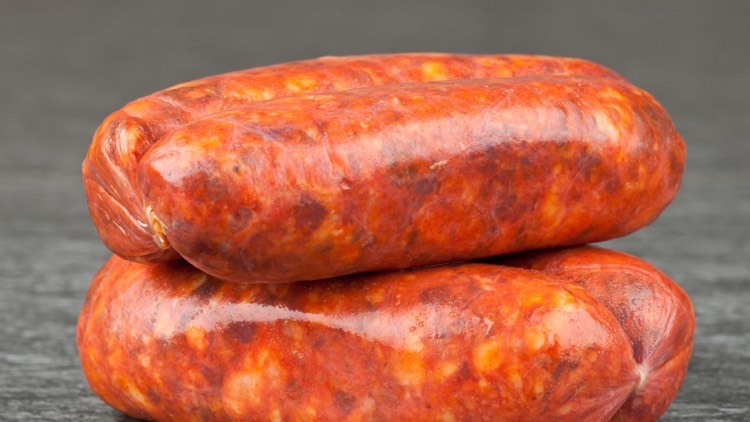 However, one thing I always try to have stocked up is fresh chorizo as it’s really handy when you’re in a rush or want to cook something quickly without losing out on flavour. As so many great a great dish does, mine started with dripping and onions (I hasten to add that this blog post isn’t strictly a recipe but more of a rough guide, so please don’t get frustrated at me for not quoting grams and litres but read more as a flavour guide and recipe idea for you to experiment with). I use dripping because the smell of aged beef fat makes me happy and there is not a lot more to it. Always take your time with your onions, cook them slowly and remember that there is no need to stir the death out of them. Once they went see through I diced and added the fresh chorizo, again leaving it well alone once in the pan. Let it caramelise and release its oils as it’s this slow caramilisation that gives, what we food snobs call, depth. This cannot be achieved through seasoning, so do it now or forever hold your depth. Next went in some rice which, like all ingredients, comes down to quality- any old average rice will give you any old average result. I have been reading up recently on low country cooking and deep southern American food in an outstanding book by a chef called Sean Brock. He is one of the chefs leading the way with new American cuisine; I really recommend picking up a copy. In his books he discusses his favourite type of rice grain, the Carolina Gold, I found it online last week and got some shipped over. Bung in the rice and allow it to cook slow and steady so it gives off a great nutty aroma and has time to soak up the chorizo fat. After about 10 minutes or so of constant stirring it’s time for the chicken stock. I make mine in a pressure cooker and freeze it down, but don’t stress if you don’t do this as supermarkets now offer some fairly good ones. At this point it’s pretty much like a Risotto, I also season with our signature Bartlett Mitchell bbq spice rub to add further flavour. The rub came about from a recent obsession with bbq food and everything that comes with it (having a Texan boss took its influence). My risotto’s now starting to look pretty good, all it’s lacking is a creamy element but cream and chorizo doesn’t work in my book….but eggs?! Why not? Huevos rancheros is one of my favourite breakfasts and that has eggs, spice and pork! So, in go a couple off eggs and the whole dish is stirred round in an egg fried rice style. Off the heat and it looks good but needs to be finished with a raw flavour to add another level of depth. I have some spenwood cheese in the fridge which is not only one of my favourites at the minute but is made locally. It has parmesan like savouriness to it and compliments the dish really well; grated all over with my trusty micro plane, a drizzle of some extra Virgin rapeseed oil from 15 miles up the road and a good whack of my favourite hot sauce to complete the dish. When you say the ingredients as they are: pork, cheese, eggs and rice it doesn’t sound so hot but, using things you have eaten in the past, things you have read about and just being confidant enough to try it, you can come up with some great things. If I ever meet you in person I will tell you about my life changing recipe of super noodles and duck fat.